Awareness days, weeks, and months are now a common part of nonprofit campaign plans. These ‘unofficial holidays’ are typically designated by government, nonprofits, and other private organizations to raise awareness about a specific issue. Awareness days also include a measure of education, as well as a heavy focus on donations from new and existing donors. Think of the month of October, and the first awareness campaign that probably comes to mind is Breast Cancer Awareness Month. It’s probably the most famous awareness campaign in the month, with pink everything (including car commercials and NFL gloves and cleats). Every month has multiple awareness days. While there will always be competing awareness campaigns, it is possible to break through the noise – with a stellar awareness strategy. Try scheduling your nonprofit’s main fundraising event during the awareness month (or week) that’s most closely associated with your cause. This can help maximize exposure and increase reach without having to do all of the heavy lifting yourself. Hosting your ‘superbowl’ event during an awareness month will go the extra mile to increase reach and attention from new and existing donors. Holding an event during an awareness month allow you to build on the momentum of the awareness days and motivate supporters around a tangible fundraising event. Are any other organizations hosting an event at this same time? Should we try to partner up? Is there any additional significance of this date and time, such as a founding milestone? Will our donors recognize the importance of this date? Can the majority of key stakeholders, including board members, make this date and time work? Awareness month messaging is a great addition to any mission statement or vision to give your nonprofit an added boost of credibility and community. Making it simple for supporters to remember your event, especially if it comes around every year at the same time. 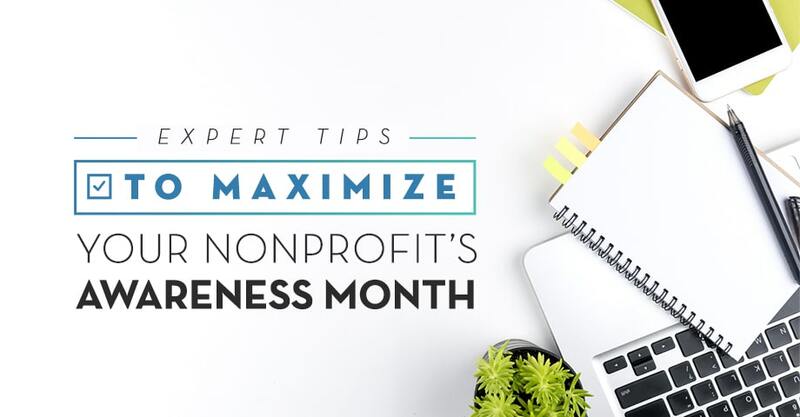 Giving new supporters or donors who might not know much about your organization a little more context just by having awareness month messaging readily available on your nonprofit’s site. Reaching a whole new audience with awareness month hashtags and other social posts (more on this later). Incorporating awareness month messaging into your event communications can help increase engagement and excitement surrounding your event. Soon, your supporters will have your awareness month memorized and will be eagerly awaiting it every year! Awareness days and months give associated nonprofits a shot of influence, which can put your cause at the top of supporters minds. Planning your event around an awareness theme can boost attendance for your events. Sending automated promotional emails in the weeks leading up to your awareness month. Partnering with local organizations that can spread your message to the local community. Contacting the awareness month organizing committee to see if there are any opportunities for more high-level engagement. It’s easy to stay top-of-mind with the right event fundraising platform in place. Look for one that enables your team to easily reach out to donors as well as enables donors to easily respond and collaborate with others. The best part of any awareness month is all of the social media coverage, so be prepared to take full advantage of the ‘free’ publicity. With the right social media strategy in place, your event (and your entire awareness campaign) can transcend a mere month and become a lasting philanthropic sensation. Use all awareness month hashtags and keywords in all your event promotion posts to increase reach. Ask donors and supporters to share any social posts with their networks for even more visibility. Look for any cause-specific sites or message boards and promote your event on there. Follow or subscribe to all relevant accounts to gain more followers and subscribers in return. During an awareness day or month, all nonprofits focusing in that specific area will be promoting their events to a huge audience. Leveraging social media is a great way to take advantage of these other organization’s promotional efforts while increasing visibility for your cause as a whole. With so much competition, nonprofits can often get stuck in the crowd. A lack of bandwidth throughout most of the year makes it hard to stand out among larger organizations, but awareness days or months make it possible for everyone to have the chance to be seen. Target potential event attendees that have a history of engaging with nonprofits such as yourselves. Additionally, find a unique angle on the awareness campaign can make your organization stand out from the other causes. What makes your organization unique? Identify this authenticity and highlight it throughout your marketing efforts. Planning your fundraising event during an awareness day or month is the perfect way to increase awareness and maximize results – if you plan ahead and have the right fundraising tools in place. Make sure you have the resources necessary to promote your campaign, engage your audience, and host an amazing event. Not Done Learning? Get more Awareness Day inspiration! Interested in more Awareness Day material? Check out our other resources to help you create your next campaign!